Can Debutant Curtis Be Top American? Bobby Curtis has an extra incentive to win prize money at the 2011 ING New York City Marathon. Leading up to it, he trained in Wayne, Pa., near his alma mater Villanova, where has a home and spends 4-5 months a year. After the half he returned to the altitude of Mammoth Lakes. “My biggest week was 130 miles—a career week,” he says, assessing his past month. “Mostly it’s been 100-110 miles a week. 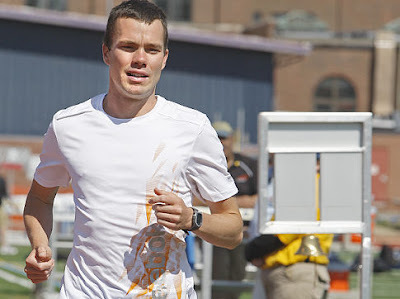 Bread-and-butter marathon stuff, a lot of volume.” He’d meet up with Meb Keflezighi, Alistair Craig, and Patrick Smyth and glean their marathon advice. “Meb told me you have to respect the distance, but you can’t be afraid of it,” says the beanpole Curtis. Curtis appeared neither anxious nor nervous when he laid out his race strategy. “On the best day, I think I can run 2:09,” he says. “If the leaders go out in 63 minutes for the first half, then there is no way I can do that. I won’t go out any faster than 64:30. If the pack is going slower than that, I’ll be with them, but if they are faster, then I’ll be by myself. For context, in 1980 Alberto Salazar ran 2:09:41 to win his debut marathon, which happened to be New York. Salazar’s 5K and 10K personal records at the time were similar to Curtis’s 13:18 and 27:33, so a sub-2:10 is possible. The main difference is that now the front of the field finishes two minutes faster. The hopes are high for Curtis. He’s been successful at every level of his career. As a boy growing up in Louisville, Ken., he played all the sports, including track and field. He could beat most people at the distance races, yet he competed in the sprints and high jump because they were shorter and easier. However, in middle school, he had an epiphany. “I was coming in third in the high jump and was like, ‘I could be winning the mile.’” He moved up and won a total of 18 individual and team state titles. 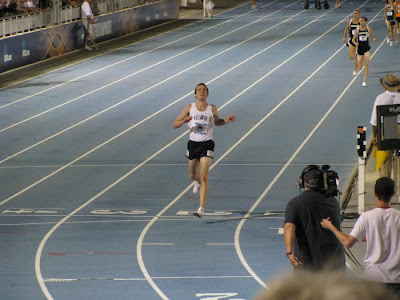 While at Villanova, he was the 2008 NCAA 5,000m champion. At a program known for its legends, he posted the second-fastest 5K time in school history, behind only former 1500m world record-holder Sydney Maree. Curtis has raced sparingly since graduation, though it’s clear he has the work ethic and talent to excel as a professional. He’s joining the recent trend of American runners, like Ryan Hall and Dathan Ritzenhein, diving into the marathon at an increasingly earlier age. It used to be that the elites waited until the tail end of their careers—their 30’s—to attempt one. 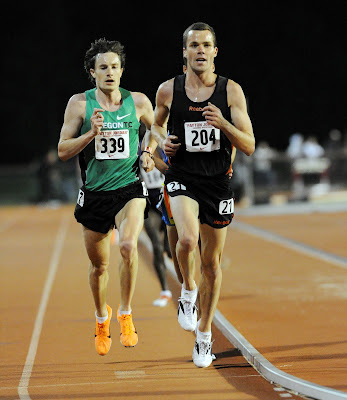 Curtis explains the appeal of the 26.2 mile test in three simple reasons: “more glamorous, more money, and more [marketing] opportunities.” For example, a 10K at Stanford, while fast, doesn’t offer the same kind of prize purse or international media platform as a major marathon. At the very least, it might give him more leverage the next time he gets pulled over.